A quick and easy dessert that is naturally sweetened and perfect for the Fourth of July! To make the crumble, place the pecans and shredded coconut in the bowl of a large food processor fitted with an S blade. Process until a crumbly texture is formed, then add in the maple syrup, coconut oil, and salt. Process again, until a sticky and crumbly mixture is formed. If you didn't cook the strawberries in an oven-safe dish, transfer the strawberry filling into a 9-inch square baking dish, and then sprinkle the crumble over the top evenly. Bake at 350 for 15 minutes, or until the top is lightly golden. 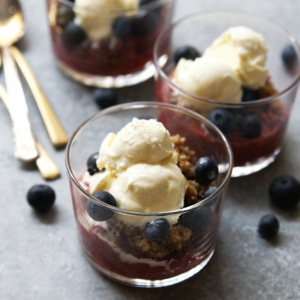 Serve warm, with a scoop of ice cream and fresh blueberries on top.